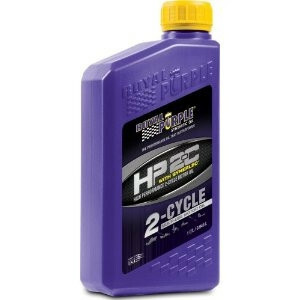 Royal Purple HP 2-C (formerly 2-C TCW III) is recommended for use in both pre-mixed and oil-injected gasoline 2-cycle engines in outboard motors, and other 2-stroke power equipment. Royal Purple HP 2-C is a high performance synthetic engine oil that improves 2-cycle performance and reduces wear in both standard and high performance 2-cycle gasoline engines. Engineered with Royal Purple’s advanced technology, HP 2-C is completely ashless to minimize deposits in the combustion chamber and exhaust system. HP 2-C has synthetic solvency that keeps spark plugs and exhaust ports clean for maximum 2-stroke engine efficiency. This engine cleanliness combined with HP 2-C’s low coefficient of friction promotes increased horsepower and engine speed. That means your higher-revving, hard-working 2-stroke engines operate with greater combustion efficiency and go longer between overhauls when lubricated with HP 2-C synthetic engine oil.